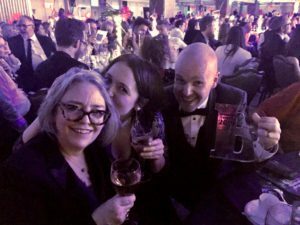 Cwmni Da’s childrens’ programme Deian a Loli continued its run of success last night with a Highly Commended prize at The Broadcast Awards in London. Standing out as a low budget S4C production amongst some of the biggest names in international programming, the series proved that it is just as popular with industry experts as it is with Welsh children. The series was nominated alongside programs from Disney Junior, CBeebies and Nick Jr. for the Best Pre-School Children’s Programme at the 2019 Broadcast Awards. The judges praised the ambition of the series, which is the only live action Welsh language programme for pre-schoolers. One judge commented that the programme, which features a pair of twins with magical powers to shrink their parents, was a “mad, genius premise.” The judges were particularly impressed by the core message that children should be encouraged to take risks, conquer their fears and use their imagination to solve problems. The award is the latest accolade for a production which has received national and international recognition. Now in its third series, Deian a Loli won the BAFTA Cymru 2017 award for ‘Best Children’s Programme’ and was again nominated in 2018. The programme was also nominated for the 2018 Celtic Media Festival Award. Deian a Loli is currently showing on S4C on Wednesday mornings and is available to watch online at S4C Clic and BBC iPlayer. An international version of the format, known as Dylan and Loli is being distributed internationally by Videoplugger.